To ask Charleigh Rose questions, please sign up. A secret duo??? Now I'm dying to know who you really are! I just read Stepdaddy Savage and I loved it. I can't wait for more. Charleigh Rose Thanks doll! There's so much more to come from this series (pun intended, like, d'uh). We're currently writing Cole and Jade's story, and if you think…moreThanks doll! There's so much more to come from this series (pun intended, like, d'uh). We're currently writing Cole and Jade's story, and if you think Graham and Dahl are hot, wait till you meet these two (ahem, three). 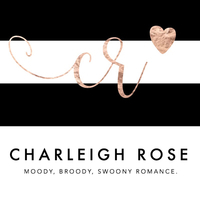 Charleigh Rose hasn't written any blog posts yet. "YOU NEED TO READ THIS NOVELLA. hahahah just kidding, I'll be back with a REAL review. BUT I LUSTED THIS BOOK. HARD." Hey Charleigh :) Thanks for the friend-vite! 44 chapters about 4 men defnitley sounds interesting, glad it was a winner.